Figuring out how to potty train a puppy properly is one of the most important, and dreaded, tasks you face when you bring home your new furbaby. If you don't get house training right, both you and your new pup will soon be confused, frustrated and fed-up. 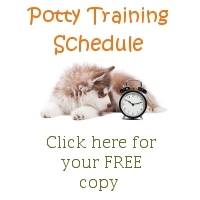 Having potty trained many pups over the years, I've learned what works (and what doesn't) and by sharing my hard-earned knowledge I hope I can make your learning curve a little less steep! You'll soon find out that your new puppy has no qualms about peeing or pooping just about anywhere! He also has NO idea that this isn't the way we humans do things and is totally oblivious to the fact that you think his behavior is unacceptable. So, it's up to you to help him learn where you expect him to pee/poop as quickly as possible, with love, patience and understanding. If you have an adolescent pup or an adult/older dog click here for more information on housebreaking older dogs. Start Out The Right Way! If you follow the simple, step-by-step guidelines on this page you'll be able to avoid the majority of accidental or misplaced 'puddles and piles'. You'll be less frustrated, your pup will be less confused and you'll both be happier! But don't expect to housebreak your puppy in 5 days, or 7, or 10.... those kinds of expectations are unrealistic. No matter what anyone promises you, it is extremely unlikely that your puppy is going to be properly housebroken within a week or two. Of course there are always exceptions, and your little one may be a really quick learner, but it's best to expect the whole process to be ongoing for some weeks/months to come. Your pup learns through repetition and by linking cause-and-effect. When you help him make the right connections (by anticipating his needs and showing him what you expect), he quickly gets into the right habits. Habits that he'll follow for lifetime. BUT, if he's allowed to build up bad habits (such as peeing on the living room floor) it will make life much more difficult than if he gets into the habit of feeling the grass in the backyard on his paws before he lets loose! House-training begins the minute you bring your 'baby' home, so being prepared beforehand is always recommended. 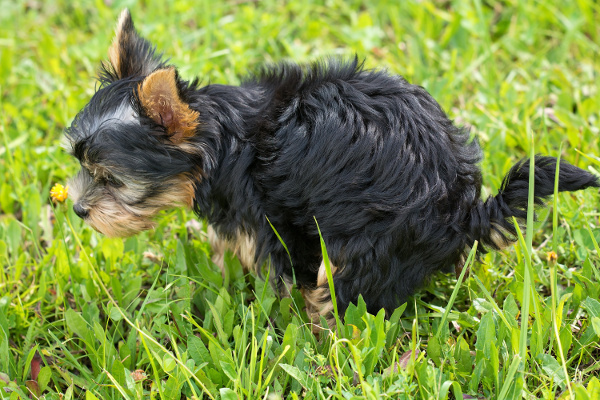 Make sure there's an area of your yard just for your puppy, and ALWAYS take him there to potty. Introduce him to it as soon as you get him home, before you even take him inside the house, and hopefully he'll be ready to relieve himself. Realize that puppies need to potty a lot! The average 8 week old pup needs to go out approx. every 30 mins to an hour during the day, and most will need at least one potty break during the night for the first few weeks. Always take him to his potty spot after every meal, nap and playtime - and anytime he is whining, circling and sniffing, or seems restless or agitated (all classic signs that he needs to 'go'). Puppies really benefit from having a daily housebreaking routine that they can count on. It also helps your efforts to potty train a puppy in two ways..... It has emotional benefits because it makes them feel secure - remember how puppies love repetition and habits? On a practical level, putting your pup's meals, naps and playtimes on a schedule will regulate his bowels and make it easier for you to predict when he needs a potty break. Although at first you will be in control of when, and how often, your pup goes outdoors to pee/poop - but eventually you'll want him to let you know when the urge strikes! You can teach him to give you a 'heads-up' by using Poochie Bells. The idea is that he alerts you to his needs by ringing these little bells which are hung on the handle of the door you want him to use to go outside. To begin with you'll need to help him 'ring' them every single time you go out, and add a verbal cue such as 'Fido needs to potty' as you do so. Most pups will get the hang of this fairly quickly, and it certainly makes life much easier later on. When you're beginning to housebreak your puppy, NEVER leave your him to run around the house unsupervised. Although dogs are naturally clean animals and will do their best not to soil in their den, your home is considerably larger than a dog's natural den, and it will take some time for a tiny puppy to realize that the whole house is his den and needs to be kept clean. This is why crate training a puppy is the quickest and most effective way to potty train a puppy. While your puppy is loose in your home, watch him like a hawk.. and at the first sign that he needs to 'go' (remember the body language for this... whining, circling, intense sniffing, arching his back or even squatting) scoop him up and get him to his potty spot. 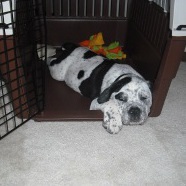 Whenever you can't watch him, put your puppy in his crate (where he will be much less likely to pee/poop at will. A puppy play-pen or a fenced-off area of the kitchen is better than letting him run free, but not nearly as effective as a crate. BUT don't put him there and then forget about him. He's still going to need to go outdoors in 30 minutes! Over time your little guy will come to associate this word or phrase with the actual action of peeing or pooping and eventually just hearing it will trigger the desired reaction. This is something that will prove invaluable when it's 20F below and you don't want to stand outside for the next 45 minutes! Always praise your puppy when he 'goes' in the appropriate spot. He wants to please you and this is how he knows he's been successful. If you want to you can give him a tiny, tasty treat as a reward too (I do this for the first few weeks and it really does help). Just don't give him a big treat because as he'll be making anywhere up to 24 potty trips a day he'd be eating his own weight in goodies in no time! Don't scold, if he makes a mistake so have you! Unless you catch your puppy in the act of peeing/pooping in an inappropriate place (and I mean IN THE ACT, not 10 seconds later) there's no point in scolding him, he won't have a clue why you're mad and will just be scared. He may look guilty, but it's not because he knows he did wrong, it's because he can feel that you're angry and upset and that scares him. If he's had the opportunity to have an 'accident' then you've also failed somewhere and probably should be scolding yourself! Maybe you didn't supervise him closely enough, or you forgot that he needed to go out after lunch, or you were busy when he woke up and expected him to 'hold it'. When you want to potty train a puppy, your job is to make sure he's set up to succeed, and if he's made a mistake, chances are good it's because of one you made first. However, if he does squat right in front of you it's perfectly OK to say "No' or "Bad" in a loud, firm voice. It may even startle him into pausing mid-flow. Scoop him up immediately and take him straight to his potty spot and let him finish his 'business'. Then give him lots of praise. Even if he seems to have emptied his bladder or bowels onto the carpet, still take him outside and repeat the 'trigger word' so that he understands that this is where he's supposed to 'go'. One other point that I'd like to make is that puppies NEVER make a mess on your carpet out of 'spite' or because they're upset with you! They're simply not capable of thinking in that way. They also don't know that it's wrong (until their housebreaking education is complete anyway).... you'd be surprised how many puppy owners don't realize this. This video covers just about all the stuff I've mentioned above and will help you remember it all. The speaker has a fairly slow and relaxed delivery, but the information is definitely worth taking a couple of minutes to listen to. Should My Pup Pee/Poop Outdoors Or Inside? I always recommend that when you train your puppy to do his business outdoors from day one... whenever possible. This is because most owners have this as their final aim anyway, and if you teach a pup to pee/poop indoors it simply makes the whole process much more confusing, and frustrating, for everyone. But of course, sometimes there are good reasons for having to potty train a puppy to pee/poop indoors, or on a balcony or porch. When you're trying to house train your puppy and you live in a high rise apartment building for example, or if you're disabled or have mobility issues, or if your pup is a very small breed and the weather is extremely bad etc. 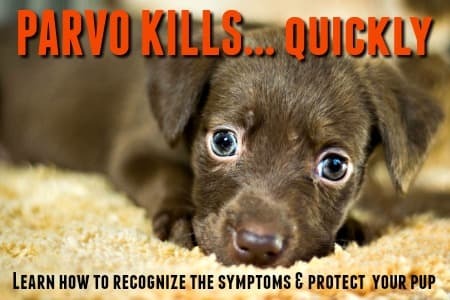 If it's not practical for you to be training your pup to eliminate outdoors, then you have a couple of options - pee pee pads, a doggie litter box/indoor doggie potty. The pee pee pads are probably the cheapest option in the short term (but they're still not cheap, especially if you plan to have your pup 'go' indoors 90 or 100% of the time). However, puppy training pads do have drawbacks that make them my least favorite choice personally, although many other dog owners swear by them! A lot of puppies see them as toys, and often prefer to drag them around and chew them up rather than pee on them! Another choice is an indoor doggie potty which is much more durable than the pee pads and come in a variety of styles, designs and materials. Several of them have real or artificial fake grass which helps later on if you want to transition Fido over to peeing on REAL grass at some point. As you've probably realized by now, house training demands a lot of your time (and patience), and a pup who is left to his own devices won't learn the right potty habits. So, what do you do if you have to be at work, or at school, for 8 hours a day? Is it possible to potty train your pup in this situation, or do you have to resign yourself to piles and puddles in the house or relegate poor Fido to the back yard? The answer to both of these questions is 'NO'! Of course if you're not there to take your pup to his potty spot every hour, or to supervise him when he's wandering around your house, playing or napping, then you can't follow all of the guidelines above. But there are two ways to handle this. If at all possible I'd always recommend crate training puppies, it's truly the easiest, quickest and least-messy option. But because a very young puppy has minimal control over his bladder/bowels, you can't leave him crated for long periods without a potty break. For an average 10 week old puppy his limit is around an hour (maybe two) at a time during the day, by the time he's 18 weeks old - or approx. 4 months - he can go 4, 6 or even 8 hours at times. This means that for the first 4 months you can crate train while you're at work but you will need to arrange for someone to come into your home once or twice a day to take him out for a potty break and some play time. Depending on the size of your family and their individual commitments you may be able to patch together a system that works if everyone pitches in - either in their lunch-hour, break time or before/after work/school. 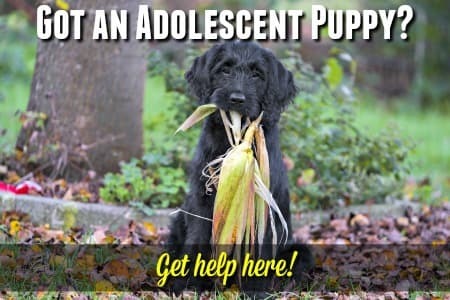 If this isn't possible, you'll often find a relative, neighbor, friend or even a local teen or retired person who's more than willing to help out in exchange for some puppy-cuddles.. and maybe a small fee if needed. Finally, there are petsitting services in most areas, or 'doggie daycare' camps and such. These measures will only be necessary on a day to day basis for the first 4 - 6 months. After that your pup should have enough bladder/bowel control to 'hold it' until you get home. But do realize, if you leave your pup home alone and crated all day, you're going to need to invest a LOT of time and effort on play, training, socialization and just plain 'ole loving when you are at home. If you can't work it out so that you can crate your puppy while you're at work/school, then you'll still need to contain him so that he learns not to eliminate wherever he pleases... and to protect both him and your belongings from damage/danger. To do this you'll need a puppy playpen and a supply of good quality puppy pee pads. Set up the playpen in a room where the floor is made from a non-porous, easy to clean material such as tile. Set up a 'potty area' with one or two big pee pads (I'd strongly recommend getting the ones that are impregnated with a scent that encourages your pup to use them, and that fit a puppy-pad holder which is a plastic frame that keeps the pad taut and helps to stop it getting chewed up and dragged around). Add a few sturdy, safe puppy chew toys so that he has something to keep him amused, but don't add a soft bed or blanket because most pups will just tear them up, and can ingest the fabric/stuffing and make themselves quite ill or worse. You can put his crate in there with him if you like, just make sure the door is removed so he doesn't get himself locked in, or hurt by it. The aim is to have your pup eliminate on the pads while you're gone. Keeping him in his playpen will protect the rest of your home and carpets and with time and repetition he'll come to understand that the pads are an 'allowed potty spot'. This puppy housetraining method can also be used if you live in an apartment, or a home that doesn't have a fenced yard, or if you have mobility issues that make it difficult to get a puppy outdoors quickly. It's not an ideal option, because at some point you're most likely going to need to re-train him to understand that he's no longer allowed to pee/poop indoors, and that can take some time. It works best with small to medium sized breeds, because if you have a large or giant breed pup he will make big messes and then you'll have a lot of cleaning up to do! BUT, it is a stop-gap method of potty training that works if it's necessary. * If you don't want to buy a playpen you can shut your pup in a small room such as a laundry room or mud room, and put a baby-stair-gate on the door to keep him inside. A playpen is better though because it's a smaller, more confined space and your pup is less likely to think that any room is a suitable potty place. Luckily your new puppy doesn't need to pee every 30 minutes at night too, but he will need at least one potty trip outdoors (more likely 2 or 3 during the first week or two) between the time you got to bed and when the alarm goes off. Puppies are like babies in so many ways (well, they are babies of course!) and loss of sleep goes along with the territory. By about 12 - 15 weeks most puppies have outgrown the need to go out during the night, but those early weeks can seem like a l-o-n-g time when you're sleep deprived. However exhausting it is you NEED to make sure when your pup cries to go outdoors at night, that you take him out! Potty training takes consistent 24/7 effort during the early weeks, but it's well worth the effort in the end. What I'd recommend is to give your pup a potty break right before you go to bed at night (even if he's napping by then or whatever), then put him in his crate, turn out the lights and ignore his initial fussing. Most puppies whine and cry when they're first being crate trained, it's normal, and as long as you know he's 'done his business', and is just crying because he doesn't want to go to bed, you can ignore him. But, once he's slept for a while and wakes up and starts to whine then he most likely needs to go outside. Make night-time bathroom breaks short and to the point. No eye-contact, low voice, minimal talking... you don't want your puppy to have so much fun that he wakes up just to spend time with you! If you choose not to crate train your pup then I wouldn't recommend letting him sleep on your bed, or in your bedroom - chances are when he needs to pee/poop in the night he'll simply find a convenient spot and do his business. The best alternative would be to use the playpen containment option as I talked about in the section on housebreaking a pup when you have to go to work all day. 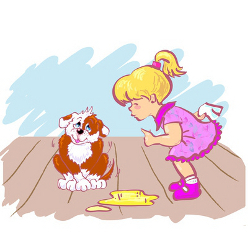 When you're trying to potty train a puppy there are always going to be occasional accidents - no matter how careful you are or how smart your puppy is! Whenever this happens you need to clean it up immediately using a special cleaner/deodorizer such as Nature's Miracle Stain & Odor Remover to remove every trace of urine/feces. 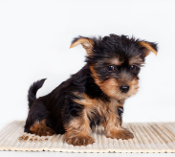 Puppies are attracted back to the same areas by their own smell and ordinary household cleaners simply won't do the job of removing all the lingering odor. Although YOU may not smell it, your puppy will, so always use a product that's been specifically designed for the purpose. Although there are a whole host of dog urine cleaning products on the market today, some are better than others. You can find a full list of the ones that I personally recommend on my Dog Urine Cleaning Products page. I love the '...For Dummies' series of dog training books, and this one's no exception. The very words 'house-training' can strike fear into the heart of puppy owners everywhere! well, there's no need to panic if you have this book in your own, personal library. Written with a humorous touch, this puppy training book is packed with practical tips and information to help you potty train with confidence. It doesn't matter if you're a newbie, or an experienced puppy parent... this book will save you time (and trouble)! Check out THIS PAGE to see some of the questions other puppy owners have asked me, and the answers I gave. If you have a problem you can be sure someone else has had it too! FTC Disclosure: If you make a purchase via a link on this site, I may receive a small commission. No added cost to you.